You should not act or rely on any information in this site without seeking the advice of an attorney in good standing with their respective bar association. The attorneys in this firm are not certified as specialists by any bar or official organization. Do not send to us information unless you have first discussed the matter with an attorney at the firm. Contact telephone numbers are provided in the site. The hiring of an attorney is an important decision that should not be based solely upon written information about qualifications and experience. 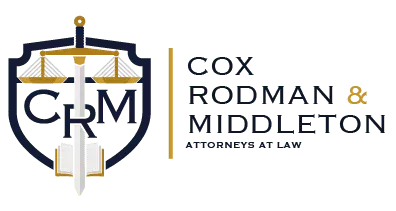 Cox, Rodman, & Middleton, LLC has endeavored to comply with legal and ethical requirements when compiling this website and does not desire to represent clients, based upon their review of any portions of this site, where such review or parts of the website do not comply with any legal or ethical requirement. Portions of the site may not be correct, complete or up to date, and Cox, Rodman, & Middleton, LLC assumes no liability for any errors. Certain pages on this site may contain links to other resources. Cox, Rodman, & Middleton, LLC does not represent that such sites are accurate or that the information contained therein is correct, nor does Cox, Rodman, & Middleton, LLC assert any claim to copyright or right to any information provided in such links. Cox, Rodman, & Middleton, LLC expressly disclaims any authorization to use trade names, registered trademarks, logos, seals or other copyrighted information contained in such links. Members of Cox, Rodman, & Middleton, LLC treat information provided by clients as confidential and strictly comply with the provisions of Bar rules and the legal requirements to keep such information confidential. The firm restricts access of NPI to those applicable parties who need to know that information to provide legal services to our clients. The firm maintains physical, electronic, and procedural safeguards that comply with federal regulations to guard NPI.